Our legendary yeti makes a holiday appearance, decked out with all the trimmings! 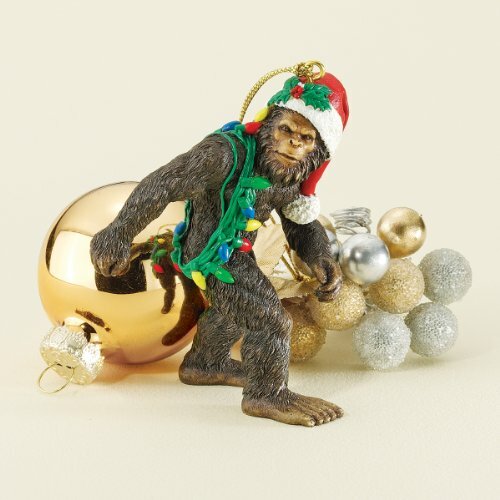 Undetected and unknown for centuries, Bigfoot is now the inspiration for this collectible, 2010-edition holiday ornament. 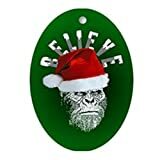 Makes a one-of-a-kind holiday tree ornament, mythical stocking stuffer, package tie-on, or creative addition to your Bigfoot collection. Cast in hand-painted quality designer resin.3"H. 1 lb. Everyone knows what a centaur is, but this Christmas get to know Santaur. Santaur is a bare-chested, half-horse half-Santa who brings presents to all the good children and he doesn't need any stupid reindeer to do it! This 6" (15.2 cm) tall glass ornament is a sure-fire attention getter during any holiday get together. It can hang by the included string or stand on its own in the middle of the dinner table as a centerpiece. 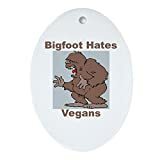 On Christmas Eve, don't leave Santa milk and cookies, leave Santaur a carrot and a sugar cube.